I was shocked and saddened earlier this week to learn that Sher of What Did You Eat? had passed away. I was a regular reader and admirer of Sher’s blog: she was a regular participant in many foodblogging events, including Daring Bakers, Weekend Herb Blogging, and Presto Pasta Nights, and her recipes were always really tempting. I admired her rescue and rehabilitation of wildlife, and enjoyed reading about the misadventures of her kitties. The foodblogging community is honoring Sher today, and I decided to post a recipe featuring fava beans in her memory. Sher was a big fava fan, growing, harvesting, and cooking impressive amounts of the beans for the past several years. I went with pasta, but it was two days in the making, because Nolan was cranky from his 4-month vaccinations and didn’t give me much opportunity for cooking—I had just enough time to peel, blanch and shell my big bag of beans one evening before he woke up and spent about three hours fussing. 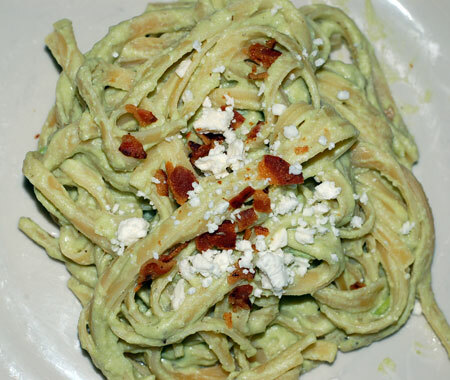 The beans went in the fridge until the next night, when I used them to make a velvety green fava sauce for fettuccine, enriched with a bit of cream and ricotta, and accented with salty crumbles of bacon and feta. I like to think Sher would approve. In further tribute to Sher, this will be my entry for Presto Pasta Nights #74, hosted this week by its lovely founder, Ruth of Once Upon a Feast. Heat the olive oil in a medium saucepan over medium-high heat until hot. Add the garlic and saute briefly until light brown. Stir in the oregano, then add the stock. Bring to a boil, season with salt and pepper, and add 1-1/2 cups of the fava beans. Simmer to blend the flavors, about 3 minutes, or until the beans are tender. Meanwhile, boil water for pasta and cook fettuccine according to package directions. Remove from the heat, add the ricotta and cream, and use a stick blender to puree until smooth. Return the sauce to the pan and add the remaining favas. Warm through and taste for seasoning. Drain pasta, reserving about a cup of pasta water, and toss with the sauce. If necessary, add some pasta water to the sauce to loosen it. Serve topped with feta and crumbled bacon. I was always so jealous of her home-grown fava beans. What a great cook and blogger she was. 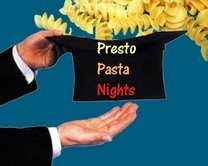 I really do miss Sher and am really going to miss her very regular, very tasty entries to Presto pasta Nights. Thanks for sharing this one and keeping her spirit alive!